It all started in 1927 when a group of animals on a farm in Upstate New York decided to travel to Florida in search of warmer weather --and faithful fans of the Freddy books have been joyously lapping up each book in the twenty-six book series ever since! Why is Freddy such a popular pig? 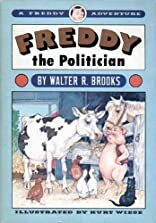 Most readers will tell you it's because he's a pig for all seasons--a detective, a pilot, a magician, an explorer, a poet, a politician... you name it, and Freddy will give it a shot! Freddy the Politician comes just in time for the upcoming presidential election. Political unrest has descended upon Bean Farm. 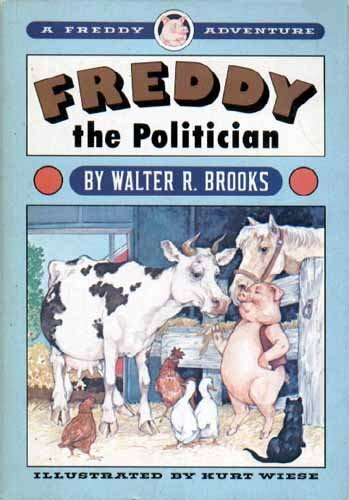 Amidst cries (and whimpers) for the establishment of the First Animal Republic, a crafty woodpecker erects his very own dictatorship, and Freddy is forced to fight for democracy in his own barnyard! About Kurt Wise (Illustrator) : Kurt Wise is a published illustrator. Published credits of Kurt Wise include Freddy and the Popinjay, Freddy and Mr. Camphor, and Freddy and the Perilous Adventure.